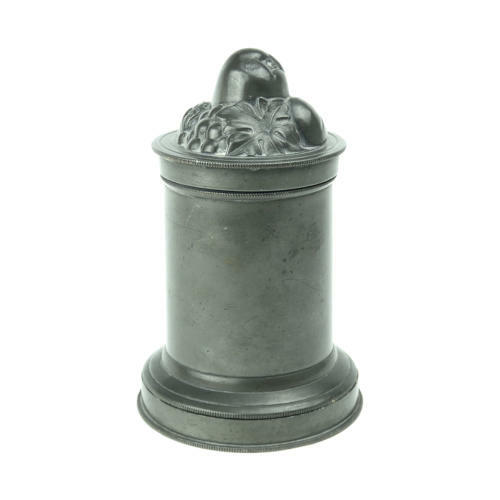 A Victorian, three part, pewter, ice cream mould. This mould has various marks to the interior of the base. There are no manufacturers marks but there is a registered design, kite mark which dates the registration of the design to 1868. There is also a large ’NO 9’, which would be a pattern number, and ‘PINT&1/2’ which relates to the capacity. The mould is in excellent, usable condition, as the interior is still in very clean, bright condition. The design would produce a fluted column of ice cream with a very well detailed group of fruits to the top. The exterior of the mould has a good, dark patina. This type of mould is very practical and easy to use.